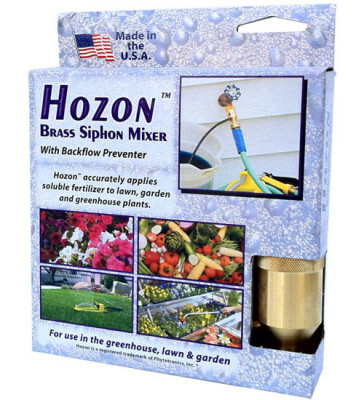 Apply water-soluble fertilizers through a garden hose with this easy to use Siphon Mixer. The Hozon Syphonject draws a concentrated solution from a bucket through a flexible suction tube and then dilutes it with the passing water stream at an approximate ratio of 16 parts water to 1 part concentrate. Made in the U.S.A. from solid brass, this indispensable garden tool will last for years. 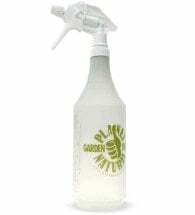 Not for use with drip irrigation systems. Step 1: Connect the Syphonject Siphon Mixer directly to any outdoor faucet. Step 2: Connect a garden hose (no longer than 50 feet) to the siphon. 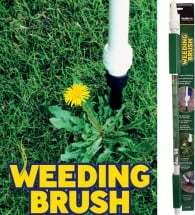 Attach a watering wand or lawn sprinkler to the other end of the hose. 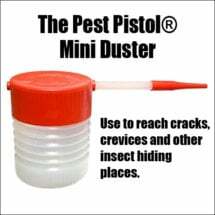 Step 3: Drop the spring end of the suction tube in a bucket with the other end connected to the siphon. Step 4: Turn the water completely on. 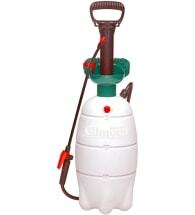 With average water pressure you should get one gallon of concentrate drawn through the hose in about 5 minutes.